Home > Removal of leaking amalgam restorations and placement of ceramic CAD/CAM inlays in one-hour appointment. Clinical case by Dr. Richard W.H. Pollock B.D.S. Reason for treatment: Patient wanted a long-lasting aesthetic restoration in one visit due to busy work schedule. 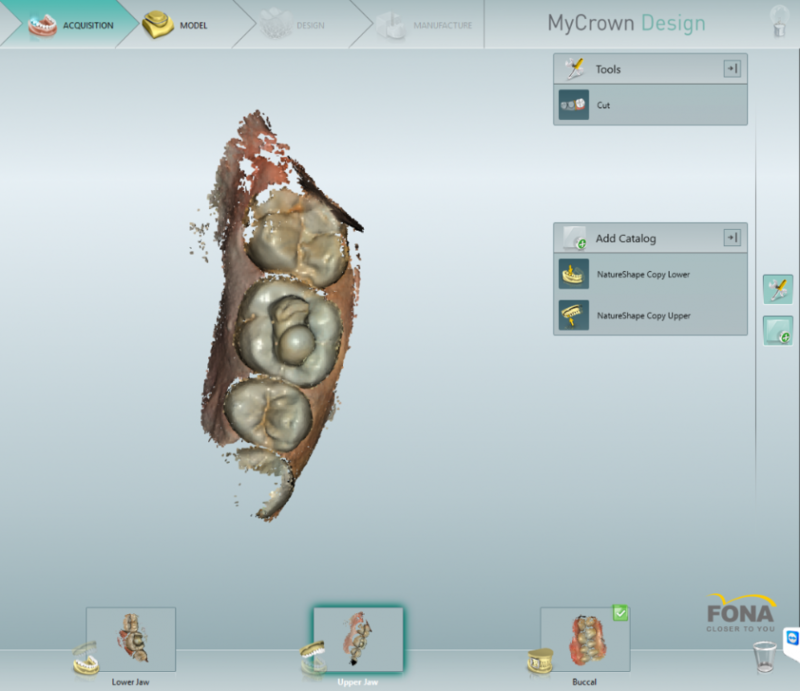 This study shows how to achieve high quality long-lasting aesthetically pleasing restorations by using MyCrown technology. A 39-year-old woman attended our clinic complaining of increased discomfort coming from her two first molar teeth when biting. This had been increasing in intensity over the last few months but her busy work schedule had caused her to continue putting off making an appointment. Although the pain she was experiencing was only a mild irritation over the last week she had reported noticing a slight metallic taste also, which spurred her on to make the appointment. 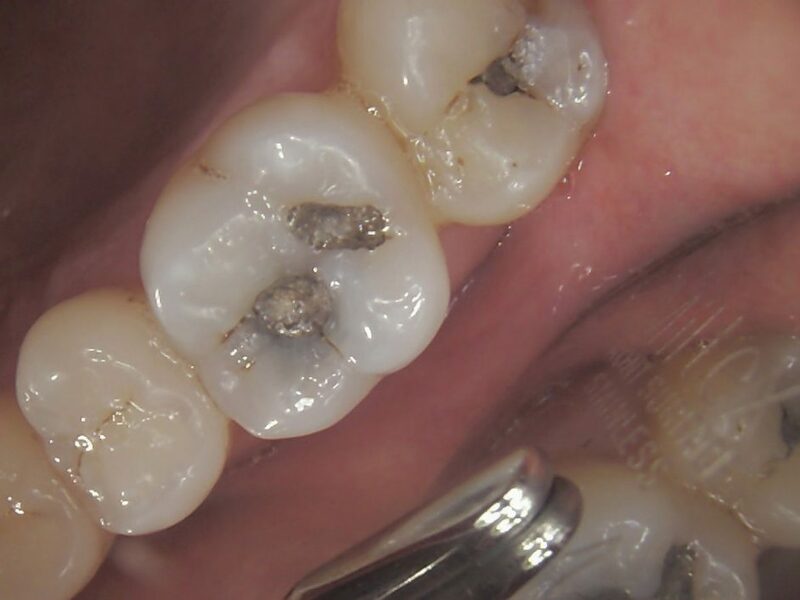 On examination, teeth 16 and 46 had amalgam restorations, with defective margins and signs of corrosion of the metal into the surrounding dentinal tubules. Tooth 46 had a vertical fracture running from occlusal surface to 1mm coronal if the gingiva on the palatal aspect. Neither tooth was tender to percussion and both scored positively with electric pulp testing. However, 46 did have pain on release when biting on the palatal cusps of the crack finder. The patient confirmed this was the sensation she had been experiencing over the last few months. 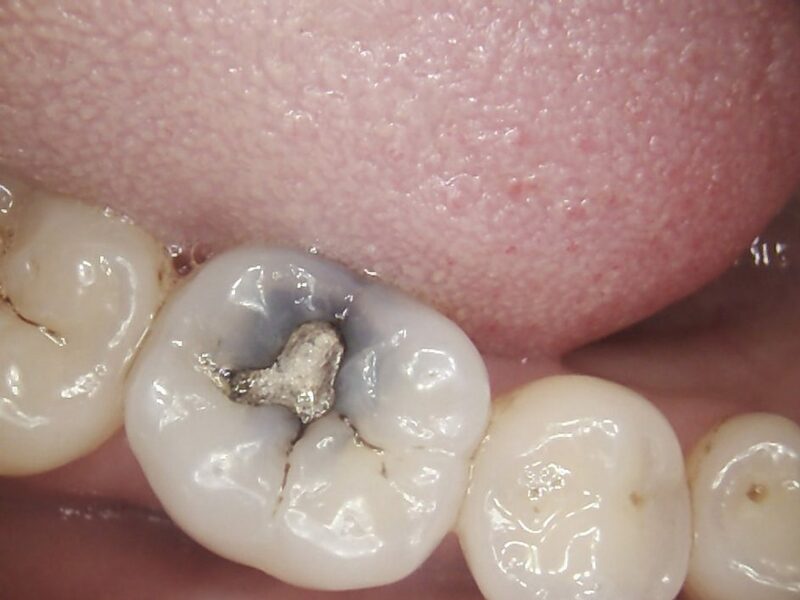 Two periapical radiographs confirmed caries under each amalgam restoration but no evidence of periapical pathology. 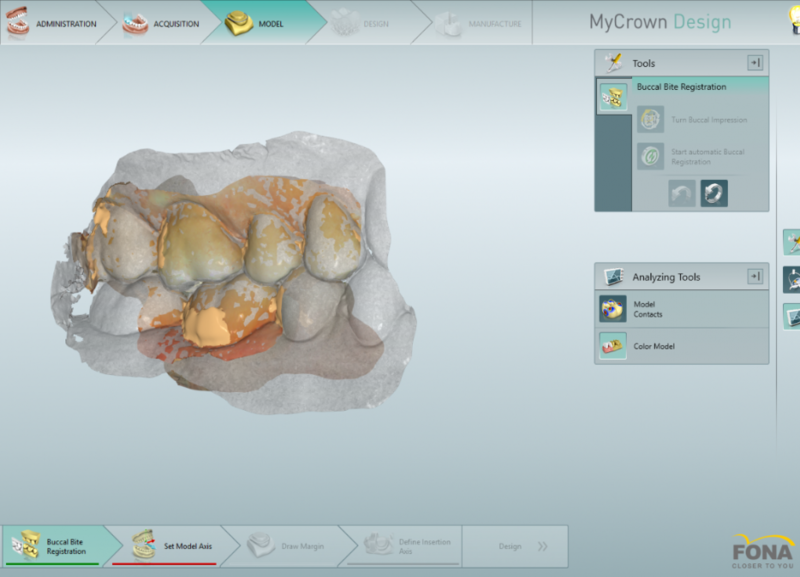 I suggested removing each amalgam restoration and any stained dentine and fractures and restoring the teeth with Inlays fabricated by CAD/CAM system, MyCrown. The amalgam restorations were removed with high volume suction, Swedish clean up suction tips, maximum water flow with High speed hand piece. Appropriate supplements were given to the patients to assist in detoxification and flushing the body of any amalgam particulate which entered the throat and gut. 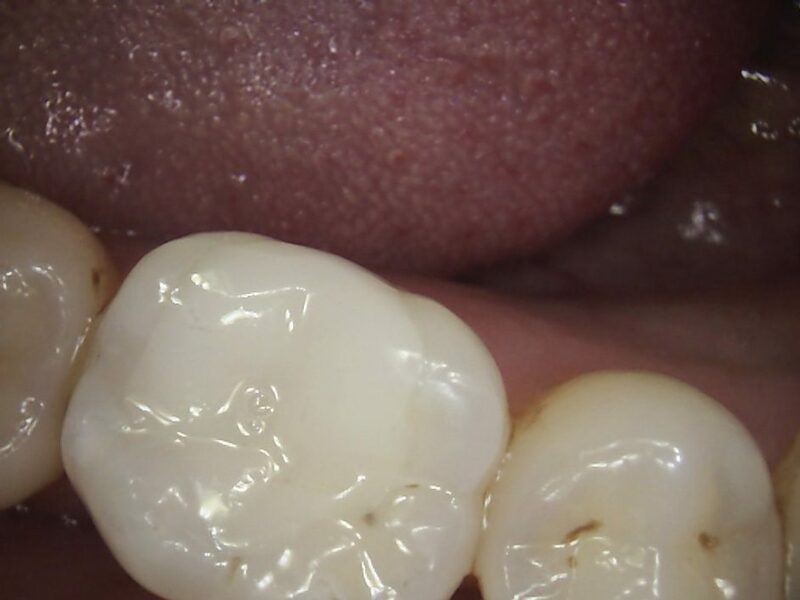 The carious and stained dentine, and fractured weakened enamel was removed with slow speed and maximum water flow. A dry pad was used in the buccal mucosa to soak up saliva and keep a dry field. High volume suction with a saliva ejector ensured dry field to assist scanning each of the teeth. 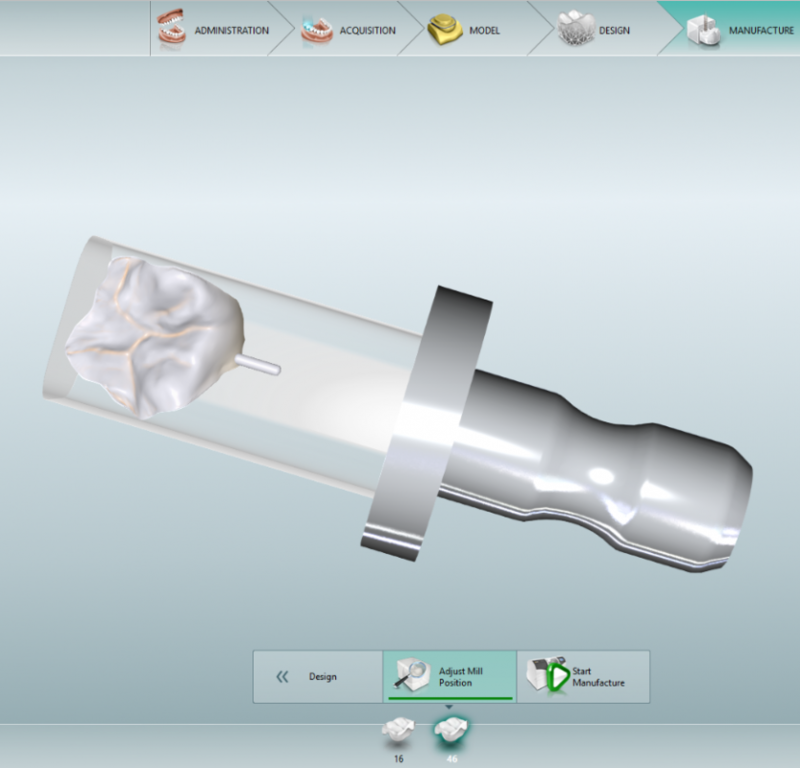 Having achieved a dry field, which is essential for every digital impression/scan, an OptraGate lip retractor was inserted and MyCrown HD spray was used on the prepared teeth. Spray was applied on one tooth medial and distal and the buccal and palatal gingival. 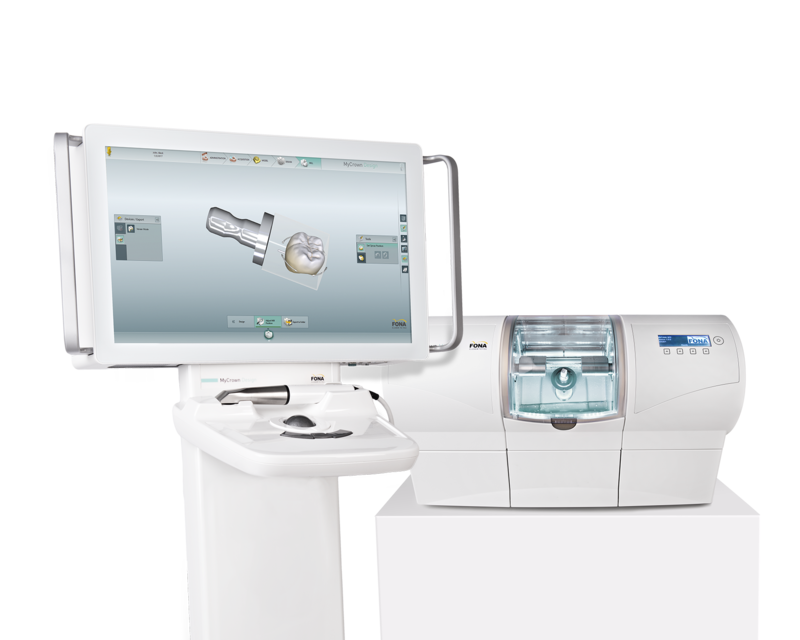 Ensuring some gingivae is sprayed and scanned increases the ease of taking the digital impression and assists when it comes to taking the buccal scan for the camera to locate and orientate. The beauty of using this technology is both prepared teeth were designed at the same time which is a huge saving in clinical time. 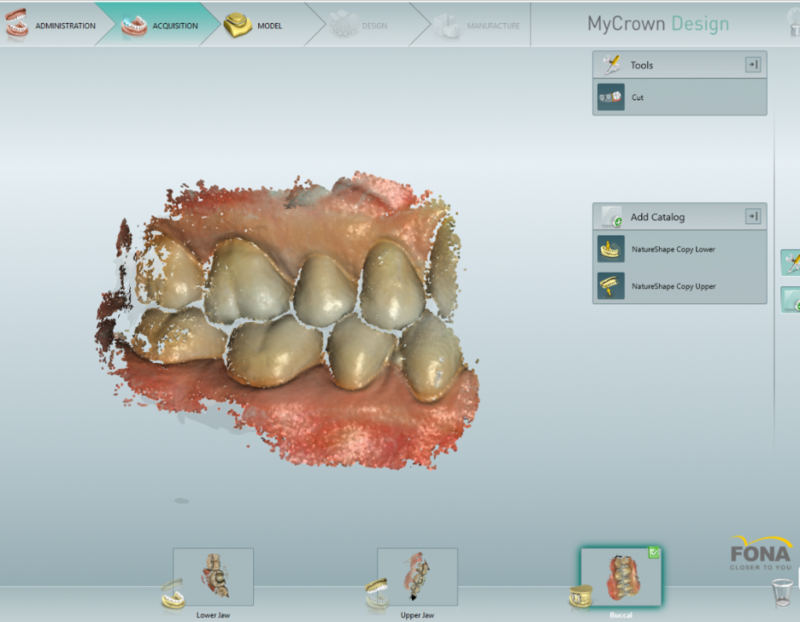 Having sprayed, then scanned each arch, then a buccal scan with the patient in centric occlusion, the MyCrown software correlated all the information and gave images of the upper lower and buccal scans. 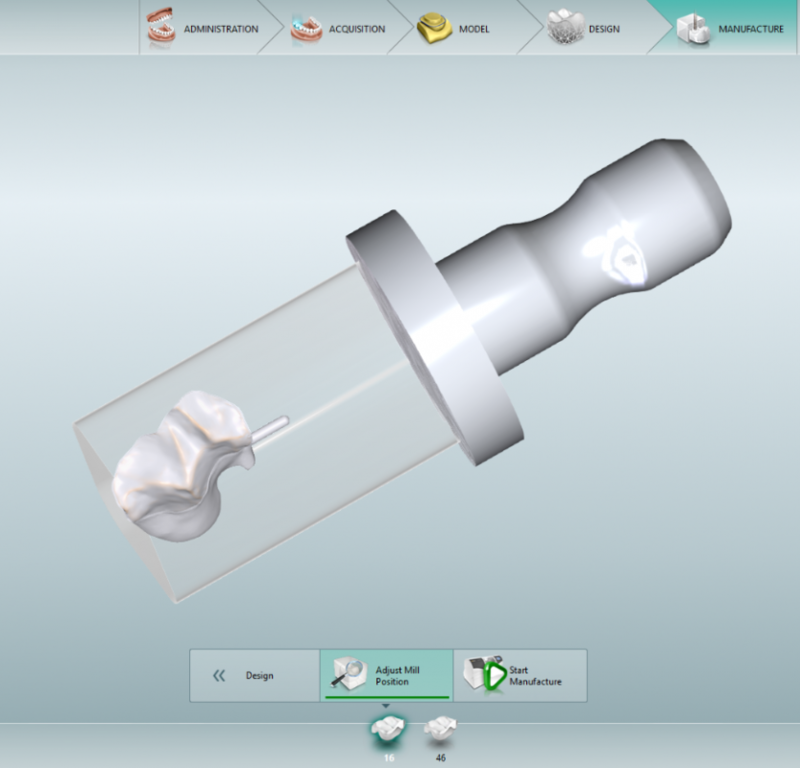 Choosing one prepared tooth first, the software asked me to create the restoration margin line. This is the yellow line, seen in the next two images. Then, moving to the other prepared tooth doing the same. 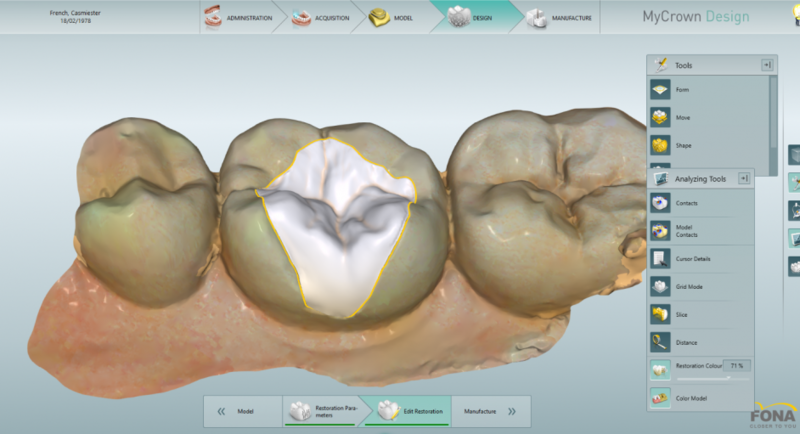 Then moving to the next stage, the software gives an initial proposal for the restoration based on cusp height if the prepared tooth and those of the neighbouring teeth. Minor adjustments were made using the form tool which allowed me to add, remove and smooth small increments of tooth structure and volume to create a functional, non-traumatic occlusion with the restorations. There are various tools available to easily and extremely accurately modify the size and shape of the restoration if desired. The restorations have colour coding where contacts in the occlusion are too heavy, which can be very traumatic to an occlusion in the sensitive patient. Once satisfied with the adjustments, the manufacturing unit processed one restoration at a time. Each restoration was manufactured in less than 7 minutes! Having tried the restorations in and polishing off the remnants of the ceramic sprue, the restorations were ready for cementation. Using ceramic etch of 9% Hydrofluoric acid the fitting surface of the restorations were left for 20 seconds before rinsing this off and applying a Bisco 2-part Silane primer. The tooth was etched and bonded with Scotchbond, and the restorations were bonded into place with RelyX ultimate. The occlusion was checked with fitting result and patient said it felt good and the opposite arch was closing fully. The restorations were polished using brown, green and blue amalgam polishers with maximum water flow using the slow speed handpiece. The patient was called the following day and reported complete satisfaction with aesthetics, no afterpain and said her “bite feels normal”. This clinical case demonstrates the ease and efficiency of providing high quality aesthetically superior restorations with minimal inconvenience to the patient. 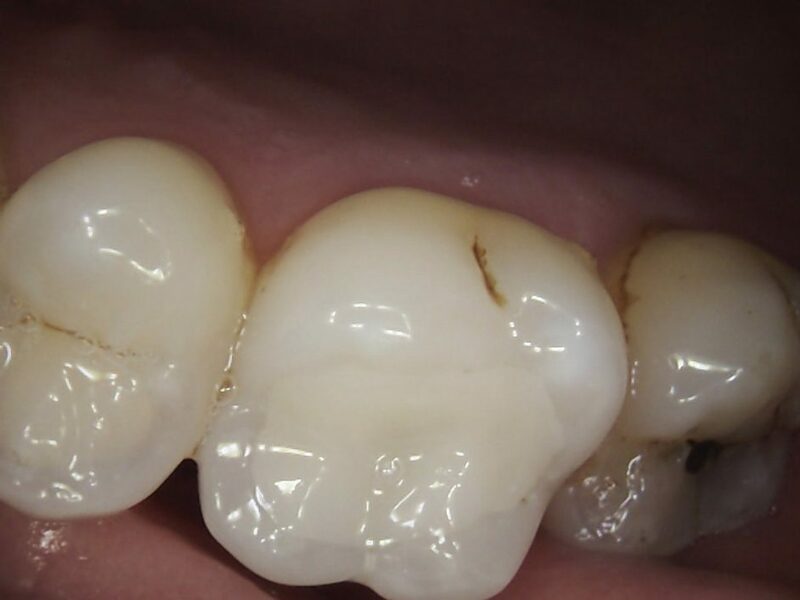 The patient was given the option of having composite resin placed instead of using MyCrown technology and this would have taken longer to provide a poorer quality restoration. It’s a no-brainer for the patient and for the dentist! 5 simple steps to ultimate quality. Dr. Richard W. H. Pollock B.D.S. 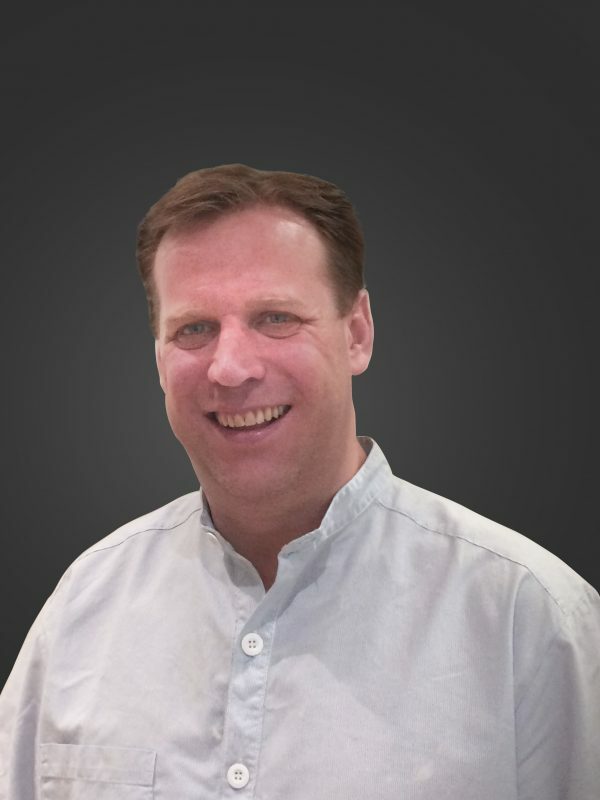 He works in three practices in London practicing cosmetic dentistry, implant surgery and safe removal of amalgam and detoxification- he has had a specialist interest in CAD/CAM dentistry over the last 15 years. 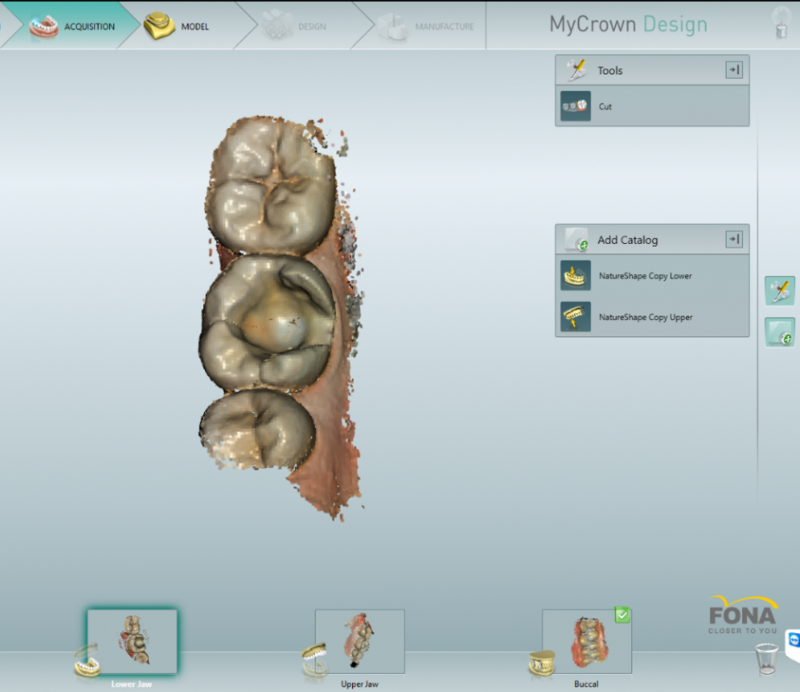 Having successfully placed over 10,000 restorations in many satisfied patients, using earlier versions of CAD/CAM technology, he is delighted to now be a proud user of MyCrown technology which he finds to be superior in every aspect of use, design and manufacture. He qualified from the University of Dundee in 1999.